In the 2017-18 season, the Baja Racing Team will compete in Kentucky, Quebec City, Kansas and finally Oregon. Midnight Mayhem in Kentucky and Epreuve du Nord in Quebec City are the "friendly" competitions where we get to bring our old vehicles and as many new members as we can for a couple days of fun. 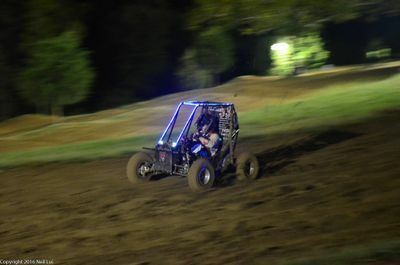 The official summer competitions taking place in Kansas and Oregon this year both last four days and we can only bring the car we'll have built by the end of this year. 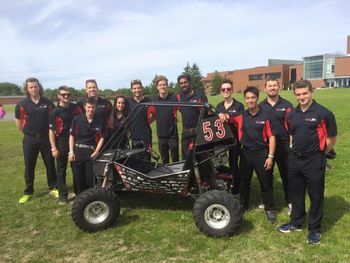 On the first day of the competition, the team presents the final product through a sales presentation and the vehicle's engine is tested for illegal modifications. Day Two – Static Events Part II The second day includes technical inspection where professional engineers take measurements and analyze the safety our vehicle. Following that, we present our design cycles while judges asses our engineering approach and ask questions about different processes. 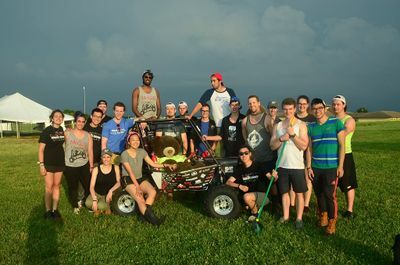 These short events usually consist of rock crawling, hill climbing, acceleration, land maneuverability, and the crowd favourite, suspension and traction. This is a very thorough test of the vehicle’s dynamic capabilities before the cars get too beat up in the final portion of competition, the Endurance Race. The Endurance Race is a four hour free-for-all race with over 100 Bajas racing head to head. The endurance race track includes sections of the suspension and traction course, a mud hole, several wooded sections and numerous jumps. The course is usually about 5 or 6 kilometers long. Usually, less than 30% of the Bajas make it till the end. 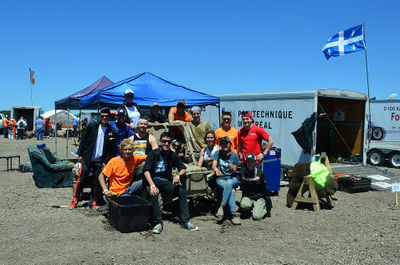 McGill Baja has a proud history full of hard work, friendship, ingenuity and sweat. From sleepless nights to Jacquelin’s Sugar Shack Challenge, we have experienced it all over the years. Starting 1984 a group of engineers, who will remain nameless due to lack of records, joined together to form the McGill Baja Racing Team. Luckily, we have been able to dig up a few photos of our retired bajas, some of which are from a time prior to the years of coloured photography. This baja was getting ready to compete in McGill’s first ever competition, the 1984 Mini Baja East competition, set in Morgantown, West Virginia. We wished we knew how well we did in our first attempt, but at least we can safely say that those attending members fought valiantly and served McGill proudly. In 1989 we return to Morgantown, West Virgina, but this time we not only race on land but also in water. 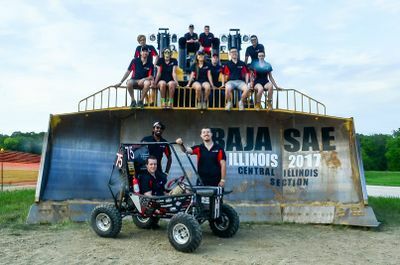 We are not sure if this is McGill’s first amphibious baja, but we can once again see the awesome power of our bajas’ to tackle any challenge that may present itself. McGill Baja splashes into the water, and floats! In 1993 McGill heads on down to Orlando, Florida for the Mini Baja East competition, this time we bring a camera that can take coloured photos. Once again we have an amphibious baja and some more wet shoes. 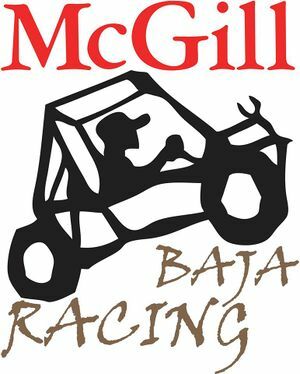 In the year 2013, the McGill Baja Team attended two competitions located in Washington and Rochester, New York. This year's car, lovingly named Taylor after hours in the shop serenading her songs, unfortunately had a few problems at her first competition, including stopping early in the last day's endurance race. However, at the Rochester competition, Taylor blew the competition away, scoring an incredible 1st place in both acceleration and hill climb on dynamics day. More notably, the team's design presenters broke another ceiling in reaching Design Finals among few other teams, setting the standard for years to come. By achieving excellence across the board, Taylor and the team won 1st place (and a super big trophy which is normally on display in the McConnell lobby). This page was last edited on 28 November 2017, at 03:18.